Flip a coin. If heads, this pokemon destroys 15 Pokemon. If tails, this pokemon destroys 4 Pokemon. Flip a coin. 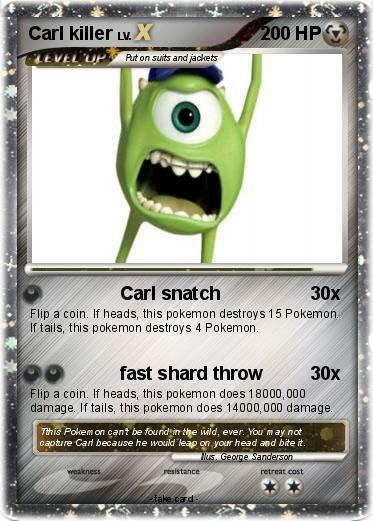 If heads, this pokemon does 18000,000 damage. If tails, this pokemon does 14000,000 damage. Comments : Tthis Pokemon can't be found in the wild, ever. You may not capture Carl because he would leap on your head and bite it.